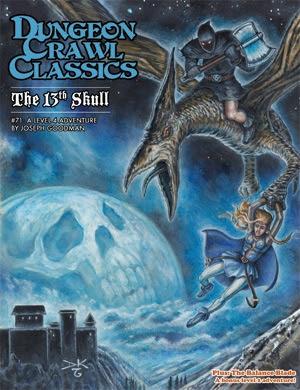 DCC #88, by Jobe Bittman, is a Goodman Games adventure module that can easily double as a campaign sourcebook. In fact, I don’t know how you can use this adventure without gaining a persistent location and a persistent group of important NPCs for your Dungeon Crawl Classics campaign. This adventure also encourages use of DCC #16 Curse of the Emerald Cobra if you have it. DCC #16 was written for 3rd Edition Dungeons & Dragons, but conversions to Dungeon Crawl Classics are pretty simple. 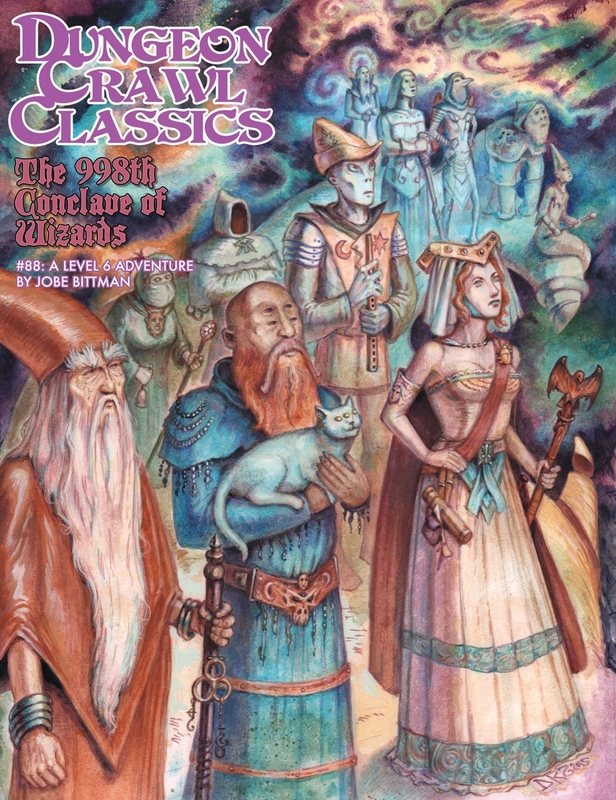 The 998th Conclave of Wizards is not a module intended to be picked up and run on the fly. The prospective judge will want to read the module through, making certain that the material is fully understood. There are also a few areas where the judge is presented with choices about how to run the adventure. Understanding these choices, and having made provisions beforehand for likely eventualities, is valuable…but at 6th level, the choices available to the PCs are such that you will need to be ready to go with the direction they pull the game. This is actually a good thing. If possible, the judge is recommended to foreshadow the adventure by seeding it several weeks before it is actually run. The heart of the adventure is the alien city of Ciz and the Star Cabal – a group of strange wizards from many different worlds. One or more PC wizards are invited to join the Cabal if they should prove worthy of the honour. Both city and wizards are suitably weird. If they are able to make it so far, the PCs can become involved in the internal politics of the magicians, explore the city, and/or undertake several challenges on the road to joining the Cabal. A four hour game session could easily entail nothing more than wandering around Ciz and getting into trouble. The module could have used Players Handouts of the various wizards, but the judge can easily make these himself from the images provided. My current players have leaned heavily away from wizards, until very recently. They have two characters (a cleric and a warrior) who have reached 6th level, but they are pretty far from this adventure to date. Despite that, there is information in the module that can be used immediately – one of the Cabalists hails from Aereth (or whatever your PC’s home world is! ), and it is more than possible to seed his name in even a 0-level funnel! The 998th Conclave of Wizards is great value for the money. The adventure is good, the persistent elements are better, and there are advanced rules for spell duels. This is another critical hit for Goodman Games! 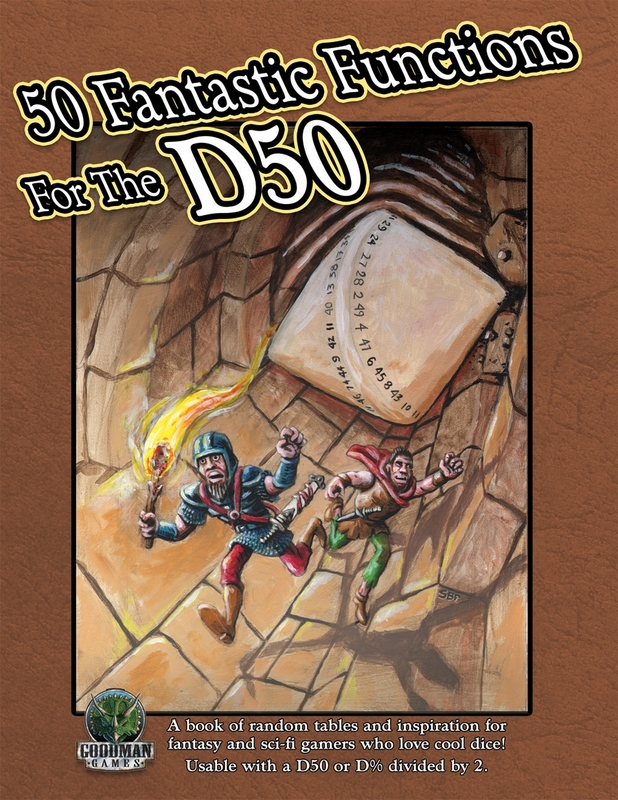 Described as “A book of random tables and inspiration for fantasy and sci-fi gamers who love cool dice!”, this Goodman Games product is obviously best used with a d50. In a pinch, you could use a d5 for the 10s place and a d10 for the 1s place. Or you could use d% divided by 2. Full disclosure: I am one of several authors, along with Steven Bean, Jobe Bittman, Tim Callahan, Michael Curtis, Tom Denmark, Jon Hershenberger, Jon Hook, Edgar Johnson, Doug Kovacs, Brendan LaSalle, Brad McDevitt, Peter Mullen, Stephen Newton, Terry Olson, Stefan Poag, Harley Stroh, Jim Wampler, James M. Ward, and Colonel Lou Zocchi. Just looking at that list of names, you have to know that there is something here for everyone. 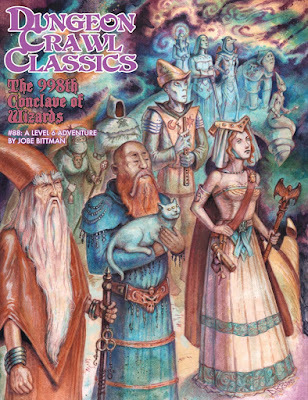 But this blog is about products for the Dungeon Crawl Classics role-playing game, so I am going to focus on the book from the point-of-view of the harried DCC judge. There are 112 pages of content, and tables on the inside of both front and back covers, so even doing that is going to be necessarily brief. 50 Minor Mishaps and Windfalls: I suggested the table, which others completed. In DCC, you are encouraged to ask for Luck checks periodically to determine random bits of good and bad fortune. Here you have a table that allows for these effects to come into play. May in encourage you to expand for additional effects, and local effects. What has it got in its pockets? 50 Pickpocketing results: Many of these are not earth-shattering, because generally people do not carry Rings of Power in their pockets. This is useful for just random trolling by the thieves in your group, because you know they are going to try their luck. You can never have too many pickpocketing results tables. D50 Venomous Creatures: A no-brainer, really. This expands the list of poisons from Appendix P to include real-world animals. I tried to put real-world effects into game terms, using the Appendix P samples as a guideline. In real life, you won’t survive as easily as your PCs do, so do not take this as a guide for what to keep as a pet! 50 Fantastic Faeries & Nature Spirits: I was going to give them full DCC statblocks, but no one wanted a single table to take up 10 pages of the book. It isn’t a monster manual. These might give the aspiring judge a place to start from in creating fey-type encounters, though! If you are like me, you are wondering, “Will this book improve my DCC game?” The answer is yes. I am going to give you five reasons why. These are not the only reasons, and others might choose different “Best of the Best” lists. As I said, there is a lot of material here. 50 Minor Mercurial Effects for DCC (Brendan J. LaSalle): Did your wizard roll a 41-60 on his Mercurial Magic result? Why should she be left out of the fun?!? Here is a d50 table to replace that “No change” result. These are very minor changes to the way a given spell works, for the most part, but some of them are pretty cool. We just started using this in my home game last week, and it has proven itself popular. d50 Potent Poisons (Tim Callahan): Whether you intend on using them directly, or to inspire your own twisted creations, this table offers fifty baleful substances which show how creative the poisoner’s art can be. Not only are the effects cool, but the names are evocative. Good luck looting your friends after they succumb to the Seventh Pokeberry of Cryax! Fifty Community Customs: Quaint, Cute, and Occasionally Creepy (Bradley K. McDevitt): There are a lot of great d50 tables in the book to help you flesh out characters, adventures, and locations. I picked this one because it is often difficult to make towns and villages stand out. Or it is difficult to remember to do so. This table will help. 50 Antique and Modern Handguns (Jim Ward): The core rules for Dungeon Crawl Classics encourage you to consider time travel. Several modules and settings allow for the use of firearms – Transylvanian Adventures, Crawjammer, Crawling Under a Broken Moon, and Black Powder, Black Magic at the very least. I will be shocked if there are no firearms in Mutant Crawl Classics. What about Frozen in Time or Beyond the Silver Scream? Whether you are considering a duelling pistol or a Ruger LRC, a black ray revolver, a derringer, or a hand crossbow, this table has you covered. Caution: Some of these weapons are too deadly for general use in the average campaign! d50-Fueled Ultra-Quick Stat Block Generator (Terry Olson): Generate a creature statblock in a single d50 roll. Why? Because coming up with unique opponents is a staple of Dungeon Crawl Classics, and this gives you basic stats, forcing you to decide what they mean. And it’s fun. You can spend an afternoon using this method to devise distinctive monstrosities to throw at your players. You can also use it to generate monsters on the fly, if you must. This book contains two “drop tables”, where the page location and orientation of a dropped die are used to determine some random information. The binding on the book, however, does not make it easy to lay it flat. My completely unofficial and unendorsed suggestion is to photocopy these pages (or print them from the pdf), in one case onto 11 x 17 paper. If you wish, laminating the copied/printed page will make it last a lot longer. Stefan Poag’s Faces in the Crowd drop table will certainly be a staple resource in urban adventures for years to come. The tables I already discussed make this work valuable beyond its cover price, but there are a lot more in here, and many of them excellent. Did I mention 50 Eldritch Gateways (Jon Hook)? Did I mention Harley Stroh’s d50 Assassin or Eldritch Tower Generators? I did not. But I could have, because if you get this book, you are likely to use them. And you are going to wonder why I didn’t mention some other table, which will be among your personal favourites. Finally, don’t imagine that, just because a table is designed for Metamorphosis Alpha that it can’t be used with Dungeon Crawl Classics. It can be. It will be.